The two satellites that make up the BepiColombo mission to Mercury were presented to the media on Thursday. This joint European-Japanese venture has been in development for nearly two decades, but should finally get to the launch pad in 15 months' time. 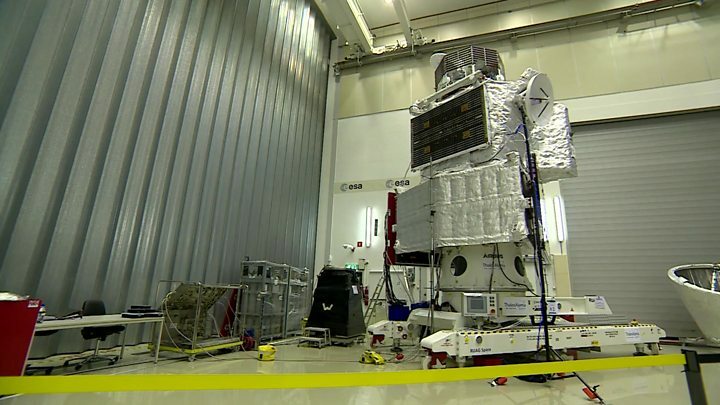 The two spacecraft will travel together to the baking world but separate on arrival to conduct their own studies. Thursday's event in the Netherlands was the last chance for journalists to view the so-called "flight stack". This is the edifice that goes on top of the rocket and comprises Europe's Mercury Planetary Orbiter (MPO) and Japan's Mercury Magnetospheric Orbiter (MMO), as well as the propulsion module to control their path towards the world that circles closest to the Sun. As a single item, the stack has just finished a series of important tests, but it will shortly be taken apart so that the individual components can continue with their own preparations. The structure will not be reassembled until all equipment reaches the Kourou spaceport in French Guiana. The double mission is due to blast away from Earth on an Ariane rocket in October 2018. Everyone will have to be patient, however. It is going to take seven years for the satellite duo to get to their destination. The gravity of the Sun pulls hard on any spacecraft travelling into the inner Solar System, and Bepi will have to fire thrusters in the direction of travel to ensure it does not overshoot Mercury. "Mercury is the least explored of the rocky planets, but not because it is uninteresting," said Prof Alvaro Giménez Cañete, the director of science at the European Space Agency (Esa). "It's because it's difficult. It's difficult to get there; it's even more difficult to work there." Temperatures on the surface of the diminutive world go well above 400C - hot enough to melt some metals, such as tin, zinc and lead. 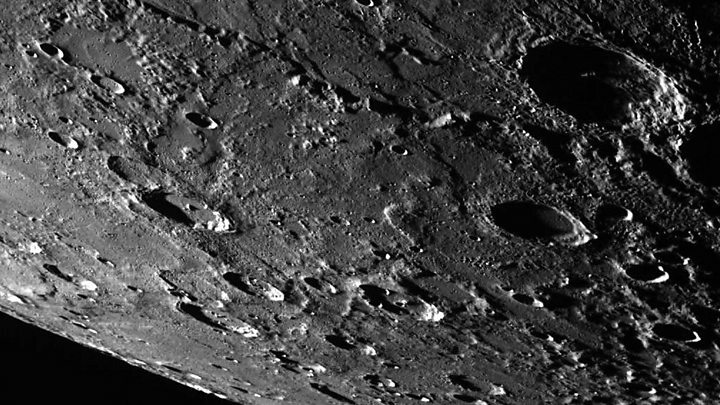 The MPO and MMO will be looking to deepen and extend the knowledge gained at Mercury by the US space agency’s recent Messenger mission. The American probe, which ceased operations in 2015, took some 270,000 images of the planet's surface and acquired 10 terabytes of other scientific measurements. It provided remarkable new insights on the composition and structure of the smallest terrestrial planet, and it made the amazing discovery that, despite those high temperatures, there are shadowed craters where it is still cold enough to support water-ice. Esa and the Japanese space agency (Jaxa) hope that the more advanced, higher-resolution technology on their satellites will be able to answer questions that Messenger could not. Esa's BepiColombo project scientist, Johannes Benkhoff, said: "We need to come up with new ideas. And for that reason we need to have good instrumentation and we need to do very close monitoring of the planet; and we can do that with our spacecraft that we're sending to Mercury." Media captionEmma Bunce: "Bepi will allow us to make a step change in our understanding"
"And the other mystery about the surface is that there isn't much iron on it, seemingly; and so that needs to be looked into in more detail and that's something we'll be able to do with our imaging X-ray spectrometer, MIXS." Europe's MPO will have a total of 11 instruments onboard. It will fly in a near-circular polar orbit around the planet, mapping the terrain, generating height profiles, sensing the interior, and collecting data on surface composition and the wispy "atmosphere". Japan's MMO will have five instruments and will investigate the planet's magnetic field. Both Esa and Jaxa are delighted to at last be approaching launch. The development of the mission, particularly on the European side, has been a torrid learning curve. The launch date was repeatedly put back as engineers struggled to find equipment that could cope with the intense heat and radiation experienced just a few tens of millions of km from the Sun. The development of solar cells in particular proved extremely problematic. "We're flying into a pizza oven," quipped Esa project manager Ulrich Reininghaus. "We had to test materials at different, very high temperature regimes, sometimes with very unwanted results." When Esa's Science Programme Committee originally green-lit BepiColombo in 2000, it had in mind a launch in 2009. Even when the industrial contract to build the MPO was finally signed in 2008, a launch was thought possible in 2013. Esa says the mission is costing roughly €1.65bn (£1.45bn; $1.85bn). This includes all European and Japanese costs. One fascinating aside. That SPC meeting in 2000 also approved Esa participation in the successor space telescope to Hubble, which is called the James Webb Space Telescope. Its development schedule has also been heavily delayed and is itself now booked for launch on an Ariane in October 2018. But it is not possible to put both missions up at the same time, so one will have to stand aside. A decision on whether it is Bepi or JWST that goes first is likely to be made this September.